Even with the glitz and glamor of Hollywood, it can be an incredibly cut-throat and hard-hearted town. It is a place filled with beautiful girls, handsome young studs, seriously respected older actors, insanely funny comics, and deal-makers who seem to have more money and power than God Himself. in such an environment, humility is a refreshing and somewhat surprising characteristic for an actor to display. Character actors and supporting players have to endure a forced humility in a town where leading men get all the glory, but playing second to a horse is an incredible test of anyone’s humility. 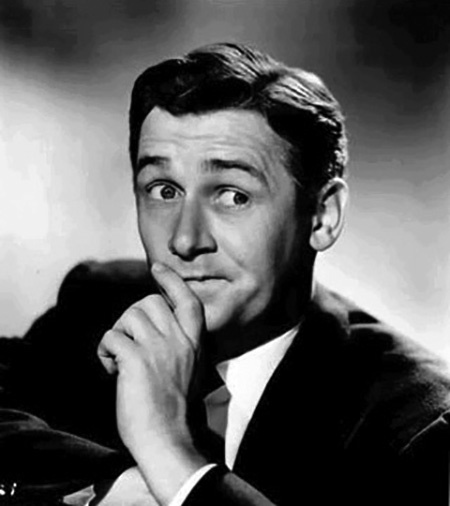 Alan Young was born in Northumberland, England, 1919, but was just a toddler when his shipyard worker father moved the family to Edinburgh and later to West Vancouver, British Columbia. Sadly, he spent his summers in the beautiful Pacific Northwest bedridden with severe asthma. Unable to run and play outside, he spent his time engrossed in the stories coming to him over the radio and began inventing his own characters and comedy routines like the ones he spent his days listening to. The doctors gave him shot after shot to treat the asthma. Alan later reported that the reaction to the shots was worse than the asthma itself, but his mother found a Christian Science practitioner who was able to treat the condition, and the lad was playing soccer the next afternoon. As a child, he entered a monolog contest and won a $3 prize. His father was sufficiently impressed (the princely sum of $3 being more than he made for a full day’s work in the shipyard) that he encouraged Alan to stick with "the talking business" because "lips don’t sweat.". Young began working for the Canadian Broadcasting Company, and even had his own comedy program, but his budding career was interrupted by a hitch in the Royal Canadian Navy during WWII. After mustering out, he began working in the United States. NBC The Alan Young Show as a summer replacement for Sal Hepatica Show. The program was popular enough that in the fall the sponsor retooled it slightly (including giving Alan a girlfriend played by Jean Gillespie) and moved him to ABC. The show moved back to NBC and a Friday night slot in 1946. The Alan Young Show came to TV as a variety program in 1950, but after 22 episodes it was take off the air for eleven months and came back as a situation comedy featuring Dawn Addams as Alan’s new girlfriend. Young co-starred with Rod Taylor in George Pal’s classic science fiction movie, The Time Machine (1960) before launching the project which brought him his greatest recognition, playing the role of Wilbur Post, the owner of a talking horse on CBS’s Mr. Ed. The pilot for Mr. Ed was created and financed by George Burns’ production company. Even though the voice of Mr. Ed, Allan Lane, chose to not take credit for his work (Lane didn’t want his friends to know that he was playing a horse), the show was very popular with audiences. Nevertheless, it was canceled in the middle of the 1966 season (Young directed most of the episodes during the final season) when CBS made the decision to divest itself of its "rural programs/"
Young took a hiatus from TV and film work during the late 1960s to create the broadcast division of the Christian Science Church. In 1974, he was tapped to create the voice of Disney’s Scrooge McDuck. He has contributed voice work to a number of animated series and video games. Alan Young passed away in 2016. A Star on the Hollywood Walk of Fame at 6927 Hollywood Blvd is dedicated to honor Alan Young’s contributions to Radio. I really enjoy the old radio plrograms very much - good memories of growing up! I usually carry several CDs in my car to listen to on Bose MP3 car radio. Love Ronald Coleman in FAVORITE STORY too.